Table 6-2-2 shows the number of persons newly received and conclusively disposed (including transfers, etc. 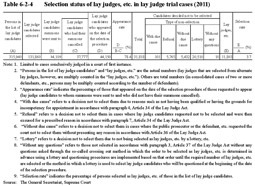 ; hereinafter the same in this subsection) in a court of first instance in lay judge trial cases (refers to cases that were subjected to lay judge trials and those consolidated with any such cases) by type of offense in 2009 through to 2011. In 2011 the number of persons newly received was the largest for robbery causing injury (total of 411), followed by homicide (total of 370), Stimulants Control Act violations (total of 173), and arson of inhabited buildings and injury causing death (total of 167 each) while the number of persons conclusively disposed was the largest for homicide (excluding inducing or aiding suicide and homicide with consent; hereinafter the same in this section; 345), followed by robbery causing injury (331), Stimulants Control Act violations (169), arson of inhabited buildings (155), and injury causing death (134). 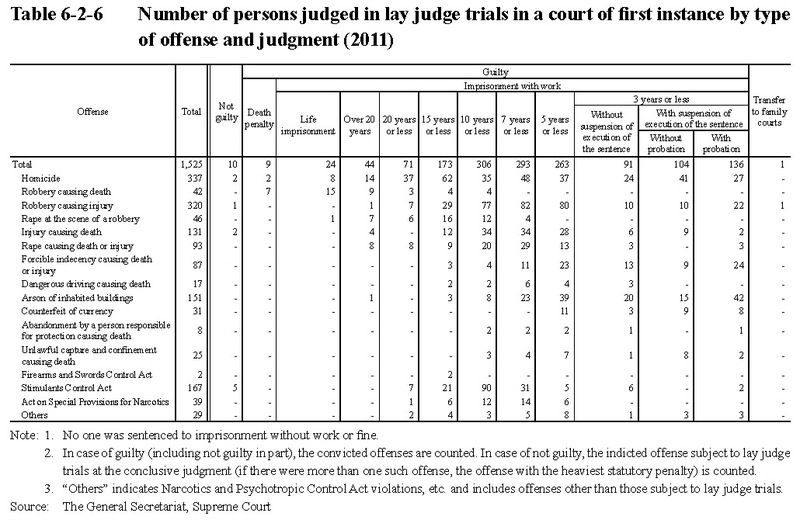 The number of persons conclusively disposed as revealed in the table between 2004 and 2008 as reference values refers to cases that would have been subject to lay judge trials if they had been indicted after enforcement of the Lay Judge Act (hereinafter referred to as “presumed lay judge trial cases” in this subsection) whereas that in 2009 refers to cases that were subject to lay judge trials and presumed lay judge trial cases. 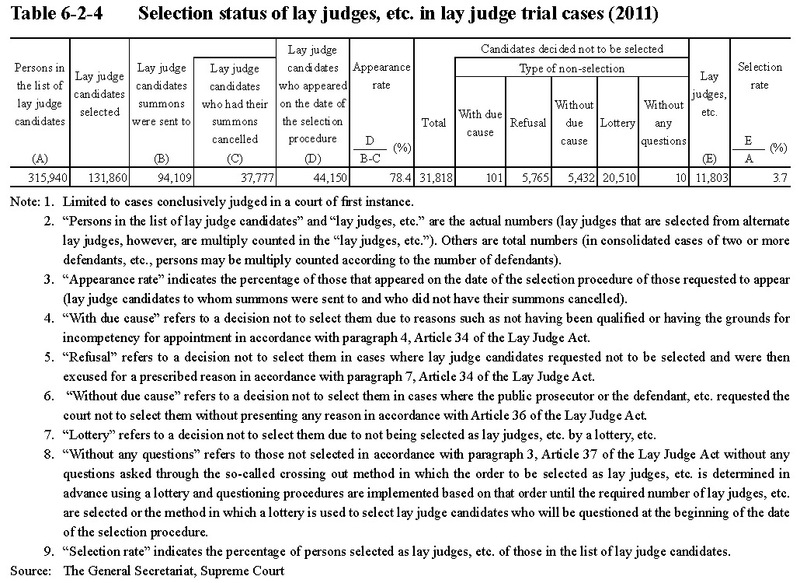 Table 6-2-3 shows the number of persons conclusively judged in lay judge trials in a court of first instance in 2011 at each district court (including branches; hereinafter the same in this subsection) and the denominator of probability to be selected as a lay judge (refers to the number such that one of this number was selected as a lay judge). 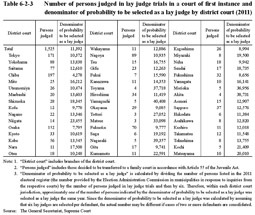 Within each district court jurisdiction, approximately one of the number of persons indicated by the denominator of probability to be selected as a lay judge was selected as a lay judge the same year. Table 6-2-4 shows the status of the selection of lay judges, etc. in lay judge trial cases conclusively judged in a court of first instance in 2011. The number of persons selected from the list of lay judge candidates and summoned to appear on the date of the selection procedure (excluding those whose summons were cancelled) totaled 56,332, of whom 44,150 actually appeared, and thus a percentage (appearance rate) of 78.4%. 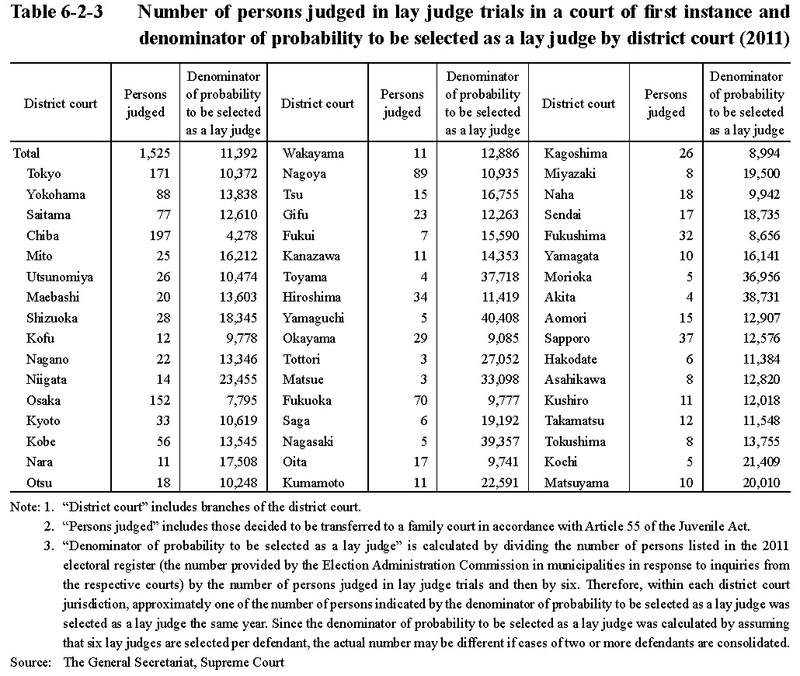 The number of persons selected as lay judges, etc. was 11,803 and the percentage of persons among those in the list of lay judge candidates (selection rate) 3.7%. Fig. 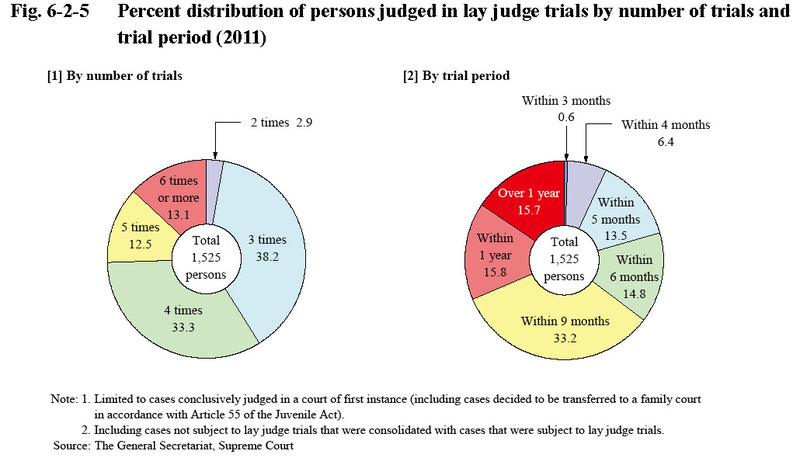 6-2-5 shows the percent distribution of persons conclusively judged in lay judge trials in a court of first instance in 2011 by number of trials and trial period (period between new receipt and conclusive judgment). A total of five or less trials took place in the majority of cases, with cases in which trials were held three times or less accounting for 41.0%. The average number of trials was 4.1. In addition, trials that took no more than six months accounted for 35.3% of the cases, but with 8.9 months being the average. Of the above the average length of pretrial arrangement proceedings of cases brought to a pretrial arrangement proceeding (excluding cases not brought to a pretrial arrangement proceeding because they were subjected to lay judge trials due to a change in the applicable penal statutes after prosecution) was 6.4 months. 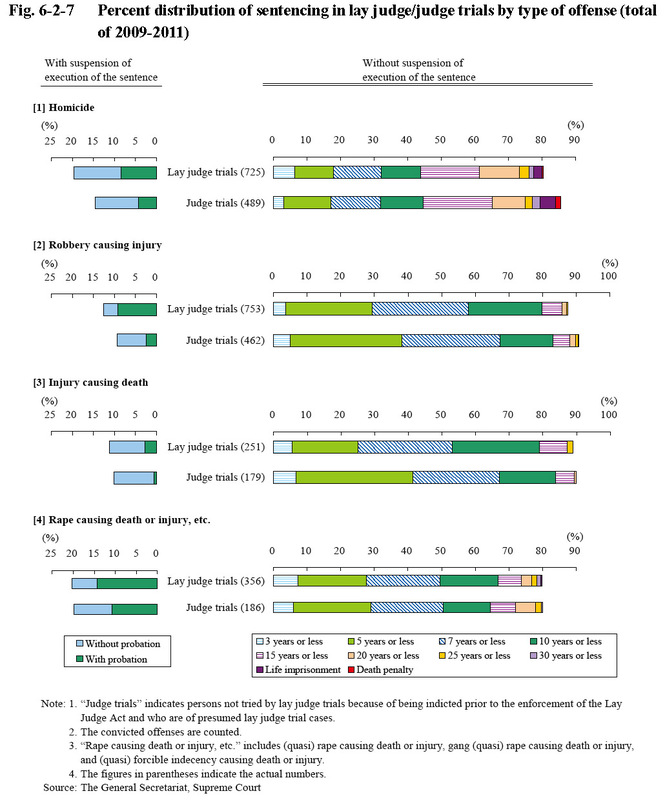 Three or less pretrial arrangement proceedings took place in 38.3% of cases subject to lay judge trials that were brought to a pretrial arrangement proceeding and conclusively disposed, four or more but no more than six in 37.4%, and seven or more in 24.3% (Source: The General Secretariat, Supreme Court). 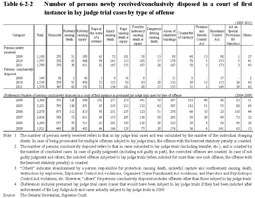 Table 6-2-6 shows guilty or not guilty judgments and the sentencing of those convicted in a court of first instance with cases subject to lay judge trials conclusively judged in 2011 by type of offense. Fig. 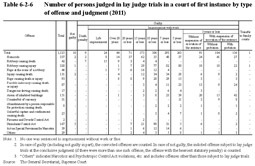 6-2-7 shows the sentencing of those convicted in a court of first instance for offenses subject to lay judge trials (total of 2009 through to 2011) by type of offense and type of trial (lay judge trial or judge trial). 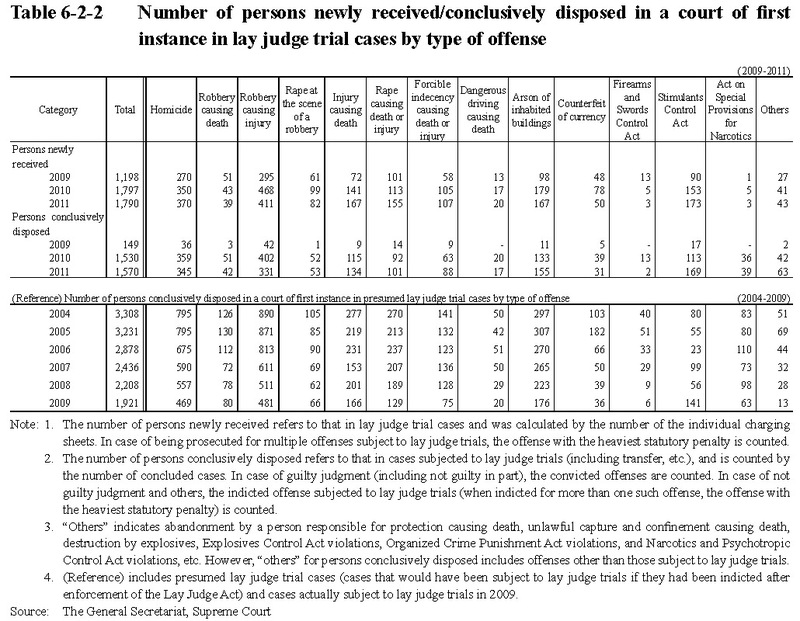 In 2011 the number of persons conclusively disposed in appeal trials against conclusive judgments in lay judge trials was 552, of which the number of appeals that were then dismissed was the largest at 444, followed by the appeal being withdrawn at 63, and then a first instance judgment being reversed and a new judgment rendered at 41 (38 involving a first instance judgment of guilty, two not guilty, and one partly not guilty).